Only available in PDF version. This resource is ideal for young children with severe speech difficulties. 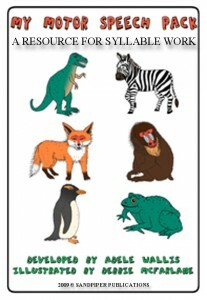 Based on best learning and teaching practices, this resource provides hours of practice at the beginning stages of consonant-vowel and vowel-consonant phoneme level. There are adorable characters for every consonant sound and each consonant is practiced in 11 vowel situations. The visual combination of character plus vowel setting provides an instant visual cue as to the syllable that is being taught. There are also character stories and general settings to complete the semantic learning setting for this motor speech activity set.